This Car Travel Refrigerator has a Capacity is 7 liters/9 cans. Cooling 40 degrees Fahrenheit to 45 degrees Fahrenheit below room temperature. Lowest cooling temperature: 32 degrees Fahrenheit to 36 degrees Fahrenheit. Heats up to: 140 degrees Fahrenheit. Features 2 cup holders, padded armrest and carrying strap. Power: 12 Volt DC, 48 Watts, 4 Ampere. 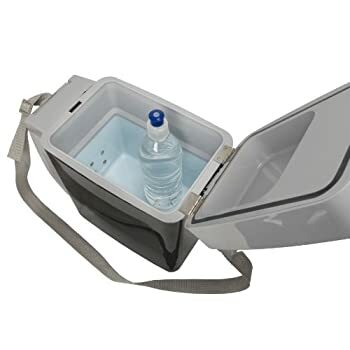 Bring food and drinks with you on the road--and keep them either hot or cold--using this Personal Fridge and Warmer. 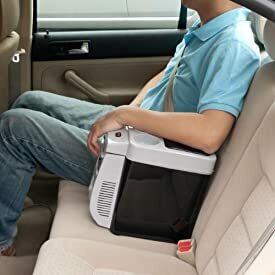 Designed to fit into your vehicle's front console, or on the front or back seat, this is great for family road trips or for anyone who spends a lot of time in their car. Pack healthy snacks like fruit and yogurt and save the time and money you'd spend stopping at a restaurant. 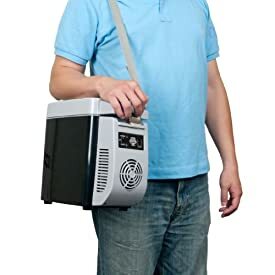 The unit is powered through your vehicle's 12-volt DC outlet and comes with an attached shoulder strap, making it easy to bring it to a picnic or sporting event. By simply adjusting a switch, you can set it to warm (as high as 140 degrees F) or cold (as low as 38 degrees F) to keep your food and drinks at your desired temperature. As a result, when you're on the road, you can enjoy healthy snacks like yogurt or cold, crisp fruit without having to stop somewhere to eat. The machine has superior foam insulation, an energy-efficient design, and a maximum cooling capacity of 40 degrees below room temperature. It also maintains the temperature you've set up to two hours after it has been unplugged. 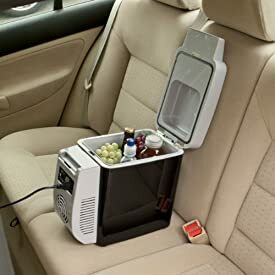 To keep snacks and drinks within arm's reach, this Cooler Warmer is designed to fit into your vehicle's front console, on the front passenger seat, or on the back seat. Two built-in cup holders and a padded arm rest provide optimal convenience and comfort. 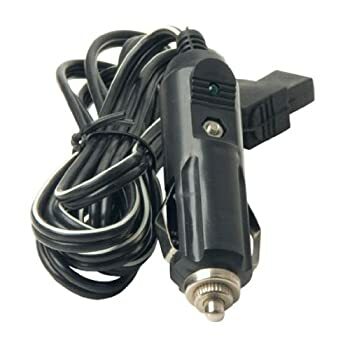 To power it, simply plug it into your vehicle's 12-volt DC outlet (cigarette lighter). The DC cord is long enough for you to place the unit in either the front or back seat while plugged in. The machine can also be powered by 12-volt outlets in boats and RVs. Included with itis a built-in shoulder strap that allows you to easily carry the unit with you on the go. This is great when you want to bring it with you to a hotel room, a picnic, or your child's sports game. This fridge/warmer has a capacity of 7 liters and can hold up to 9 (8-ounce) drink cans. It measures 11 by 6 by 12 inches (H x W x D) on the outside and 8.5 by 5 by 8.5 inches on the inside and weighs 7 pounds. The Cooler Warmer is backed by a one-year limited warranty. Personal Fridge and Warmer, DC adapter, shoulder strap, and instruction manual.